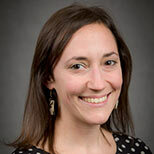 Andrea Basche is a Kendall Science Fellow in the Food & Environment program at the Union of Concerned Scientists. She received her Ph.D. in agronomy and sustainable agriculture at Iowa State University in 2015. Her research explores how more diverse agricultural systems can reduce climate risks.